Publication copyright © 2005 CM Media, Inc. Most homes aren’t hospitable to people in wheelchairs. But some architects and builders are adopting “universal design” principles. I was living a typical life—a wonderful husband, supportive family and friends, a fulfilling career and a beautiful home. Then, in an instant, my life was forever changed. While riding my bicycle on a trail in Granville on June 13, 1998, I was crushed by a 3.5-ton tree and paralyzed from the waist down. I sustained a spinal cord injury and fractures of my back, neck, ribs and sternum. After six weeks of intensive physical and occupational therapy, I came home from the hospital. I wanted to get my life back. Fast! But I soon discovered that learning to live life in a wheelchair was going to be hard. Just living in my home was going to be a monumental task. My family and neighbors had built a ramp so my husband, Mark Leder, could wheel me inside our two-story home. Once inside, frustration quickly mounted as I struggled to push myself over carpeted floors. Doors had to be removed so I could enter the laundry room, bathroom and shower. Privacy was lost. Cramped quarters in our laundry room made me angry as I banged up the washer, dryer and walls with my wheelchair. To use our top-loading washer, I had to use a reacher, a stick with grabbers on the end. It took forever to do a load of laundry. Mark and I also operate our businesses from home. But now more than half of our house is physically “off limits” to me, including Mark’s second floor home office, the guest bedroom and bathroom, and the basement. The kitchen is far from being wheelchair-friendly. The cabinets above the counters are too high, and I must use my reacher to get items off the high shelves in the pantry. I strain to do dishes by positioning my chair sideways at the sink. Countertops are too deep, and too high when chopping or stirring food. There is no space for my knees under the range, and I can’t see inside large pots. Since the oven door opens from the top, it is difficult to remove items inside. Electrical switches and outlets on the walls above the countertops are out of reach, as is the freezer above the refrigerator. The ramp at the front door that was built for my homecoming was too steep for me to use on my own; every time I wanted to leave my home, I had to have assistance. After several months, our front porch was modified and an electric lift was installed so I could get into my home independently. Funding was provided by the Ohio Rehabilitation Services Commission (ORSC), which assists people with disabilities in achieving employment and independence. In the past six years, I have learned to redefine “normal” and live in our home as best as I can. I also learned to be patient, and Mark learned how to take orders from me, retrieving items that I need. As Ms. Wheelchair Ohio 2004, I also have become an active advocate for people with disabilities. Recognizing the limitations of our existing home, Mark and I have discussed building a new home ever since my injury. We have collected articles, ads and brochures; gone to the Parade of Homes and home shows; researched the Internet; visited homes, and taken photos. The Columbus Metropolitan Library staff helped me search their collection. I brought home piles of books on accessible homes, “universal design” and house floor plans. Universal design principles have been around since the 1970s, originating at the Center for Accessible Housing (now the Center for Universal Design) at North Carolina State University. These home designs have helped families with limited mobility, hearing or vision. They make a home more livable in the long haul and more easily visitable by relatives (especially elderly parents) and friends. Incorporating universal design and barrier-free features does not necessarily increase building costs. And it is much easier and more cost-effective to design a new home with principles of universal design than to enlarge or modify an existing home. Universally designed spaces are accessible for people who use wheelchairs or walkers, but from the outside, these specially designed homes look no different from others in the neighborhood. Far-sighted home builders who anticipate their own and their family’s future physical limitations will incorporate universal design in their next home. The truly well-designed home is one that is functional for a lifetime. America is graying; census projections estimate that in 30 years, more than 20 percent of the population will be over 65, and the fastest-growing population segment is people over 85. According to one survey, 85 percent of people older than 65 want to stay in their homes, but 80 percent of those seniors have mobility impairments. Temporary or permanent disabilities often require people to use assistive devices. In the United States, an estimated 1.8 million people use wheelchairs. As people age in place, they can better function independently in homes that incorporate universal design principles. Families can keep their loved ones in their homes for long-term care, instead of placing them in costly nursing homes. Personally, I would rather grow older in my own home. 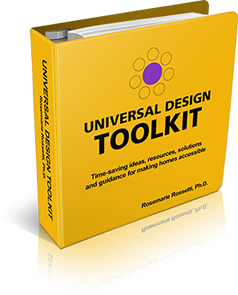 Universal design considers a wide range of human needs and abilities throughout a lifespan. Interiors are designed for everyone, regardless of age, height or physical limitations. Universal design makes sense for younger families, too. Many baby boomers anticipate that as their parents grow older, they may need to move in with their adult children. That’s much easier if the children’s homes are accessible. The market for homes that allow older people to remain independent will continue to increase—a majority of those responding to AARP surveys would support legislation to require universal design features in homes. In June 2004, Mark and I made the decision to begin building our totally wheelchair-accessible home. The design process involved identifying the barriers in our existing home and eliminating them in our new home. The goal is to make our home look homelike, not hospital-like, as well as to make the spaces functional for anyone who will live there. We decided to assemble a design team to get started. My best friend Anna Lyon, an interior designer at Lazarus-Macy’s in The Mall at Tuttle Crossing, is working with us. I count on her expertise to select and arrange furniture, flooring and light fixtures, and to recommend room colors. A new design team partner came by surprise in July 2004, after my speaking engagement in the Chicago area to the employees and distributors of Aquascape Designs, a leading manufacturer of patented pond filtration systems and complete, ready-to-assemble pond kits. Aquascape President Greg Wittstock asked if he could build a pond for us. We were shocked by his generosity! As we left the speaking engagement, Mark and I started talking about asking other vendors to partner with us in exchange for marketing opportunities. Our minds were spinning with ideas! One of my husband’s website clients, Singer Wallcovering in Cincinnati, offered to donate wallcoverings, wall guards and handrails. I was curious about services the ORSC could offer, so I called about having my case reopened. My new counselor, Julie Perrini, explained that the agency would purchase my home office furniture and pay for the services of an architect and an occupational therapist. I contacted Cheryl Sinclair, an occupational therapist at Allied Physiotherapy, who had worked with me shortly after I was injured. A fellow speaker and friend, Mike Foti, CEO of Columbus Glass Block, referred me to architect Patrick Manley of Manley Architecture Group in Clintonville. Foti has also been our advocate for securing glass block from Pittsburgh Corning Corp. for our roll-in shower, in exchange for marketing opportunities. Mark and I interviewed four architects and called many of their references. Manley impressed us with his previous experience in designing homes and assisted-living centers. His references gave him glowing reviews, and he demonstrated a sincere desire to work with us on this innovative project. His assistant construction manager, Cathy Van Volkenburg, is also providing us feng shui design consulting services. In order to build our dream home, we needed a location. Our criteria: a half-acre lot with a private, wooded backyard in a bicycle-friendly neighborhood within 20 minutes of Port Columbus. We contacted our Realtor, Bill Laakso, who estimated the selling price of our current home and calculated mortgage rates and monthly payments in order to determine a budget for our new home. After several months of driving through new housing communities, we decided to select a lot in Stepping Stone, the site of the 2001 Parade of Homes, sponsored by the Building Industry Association of Central Ohio. Stepping Stone is north of Havens Corners Road in Jefferson Township, east of Gahanna. The street had not been paved when we first visited, and I wasn’t about to make a major investment without seeing the lot. I didn’t care if they had to bring me a horse from the Stepping Stone riding stable to enable me to “walk” the lot. The horse wasn’t required, though. Sales representative Tim Jacobs of C.V. Perry, Stepping Stone’s developer, arranged to have a contractor take me for a ride in his truck. Mark and I placed a deposit on a flat, half-acre wooded lot. Before choosing Stepping Stone, Mark and I had toured many new housing sites. We called several builders and went into many model homes. I found speaking with builders about universal design homes disheartening. The sales representatives were somewhat familiar with the concept and knew that modifications needed to be made in the entry, bath and kitchen in order to make our home wheelchair-accessible. However, none of the builders could show us any plans to indicate how these modifications would be made. Builders had few ranch-style floor plans available and kept trying to assure us that they could work with us to modify an existing plan. Many told us to take their existing floor plan, erase all the interior walls and start over. When I asked about having an entrance from the garage to the house that had no step and no ramp, they were unsure how this could be engineered or if building codes would allow it. We searched floor plan books, brought the builders’ floor plans home … and rejected everything we saw. The builders had no floor plans that came close to what we were looking for—a modest-sized home, about 3,000 square feet, with homey spaces for me in my wheelchair, as well as for Mark, who’s six feet, four inches tall. We want two home offices, a master bedroom suite, a laundry facility in the master bath, a guest bedroom and bath, a kitchen, a great room, an elevator, a screened porch and a four car garage. We don’t want a dining room or a living room. Mark has an idea to build a clothing retrieval system in the master bedroom closet so my clothes for the current season will be in the closet, and off-season clothes will be in a cedar-lined closet in the basement. He really hates schlepping my clothes from the basement to our bedroom closet when the seasons change! Patrick Manley and Mark are working together to design this device, using a dry cleaner’s mechanical retrieval system as a model. Since getting the architect on our team, we have toured many homes of people who use wheelchairs, taking photos and detailed notes. We also went to Homearama 2004 in Cincinnati last September to see a ranch home built by Universal Concepts & Design. I was elated to find that I could independently wheel into the house from the front porch or through the garage. Manley has drawn several renditions of our floor plan, which we shared with Derrick Layer, chief operating officer of C. V. Perry. Layer has agreed to talk with his subcontractors about donating products and services. He feels this high-profile home will serve as a learning laboratory. In January we attended the 2005 International Builders’ Show in Orlando as guests of the National Association of Home Builders. Julieta Slattery, the NAHB’s director of marketing, invited us to tour the show and is interested in having me speak about our new home at the 2006 show. After returning from the show we met with Manley and representatives from C.V. Perry to discuss what we learned. We estimate that construction will start in late spring and our home will be completed in spring 2006. Since my injury, there have been many turning points and milestones in my recovery. I am hopeful that our new home in Stepping Stone will serve as a milestone for many. 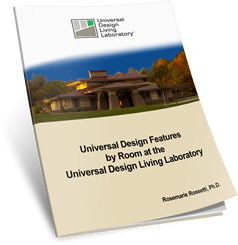 How many universal design features can be incorporated into a home? As many as the number of challenges faced by the people who’ll be living in that home. And when one of those people is in a wheelchair, the challenges go on and on. Here are some universal design solutions. We plan to incorporate many into our new home. A step-free entrance on a gradual, level grade with no conspicuous ramps. Doors without thresholds, and wide enough—at least 36 inches—for a wheelchair or walker. Hallways at least 46 inches wide. Lever handles on doors and faucets. Kitchen counters of various heights, including some that can be used by a person in a wheelchair. A shallow kitchen sink with side-mounted faucet. Open knee space under all sinks. A cooktop set into a counter with open knee space. Sliding casement or awning windows. An elevator, wheelchair platform lift or stair lift on wide stairs. Light switches no higher than 36 inches above the floor. Electrical outlets at least 25 inches above the floor. A large, full bathroom on the first floor with integrated, decorative grab bars. Large bathtubs and showers with plenty of grab bars. A slide-bar showerhead and/or multiple-height showerheads. A first-floor bedroom or bedroom suite. Wood flooring, non-slip tile and dense-weave carpet with a low (less than one-half inch) pile. Adjustable hanging closet rods and shelves. Rosemarie Rossetti, Ph.D. is a professional speaker and Ms. Wheelchair Ohio 2004. For more information or to contact her, visit her Web site at www.RosemarieSpeaks.com.